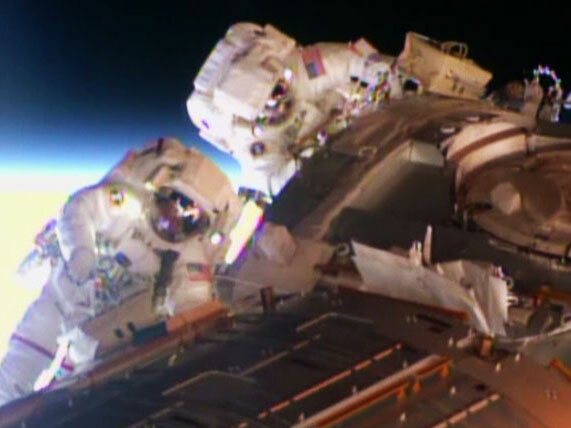 Barry Wilmore and Terry Virts, you all are brave individuals to be out there spacewalking for hours at a time. I can’t say I’d have the guts to step out into something that one tear in the suit could cause quick death. Keep it up you all are amazing! Love the fascinating facts. .. Thanks NASA. Have you heard the voice of God in the space? Great…. beautiful. Do you know that Samantha’s dream is to be out there in a space walk? I really hope that you at the ESA will consider making her dream come true. Please do, she is wonderful. These space walks seem way ahead of when the new docking adapters will be needed for commercial delivery of astronauts to the ISS. Must be a slow month on the International Space Station. Really appreciate this website. IT is fantastic. Thank you very much for funding, and keeping this site going. It benefits all of us, especially us earth bound types, who would give anything to go to space, just once. Is full of jargon, ordinary people, it is difficult to understand! If you can add more easy to understand explanation will be better. They must have been resting from this job when they flew over Lake Havasu City, Arizona at 7:53 p.m. on Sunday. Maybe they go to bed early.